Whether if you need web design, online marketing, e-mailing or web hosting – we are your competent partner. We support you to develop and optimize your corporate image and position with perfect visibility on the market. We design logos, business documents, ads, poduct flyers, image brochures or promotion – and your corporate identity is always in the foreground. Successful public relations is the mirror of your business. One of our great strength is the creative engagement of the different media channels, so the cross-media. We combine the classic with the digital media and thus have a targeted diversification and effectiveness in almost any medium. We are passionate about the thing, have fun in our work and want to work for your success - to 101%! Your presence on the Web is often the first impression a customer gets of you. With us you get a meaningful website. With SEO we increase and optimize your popularity and visibility. … the showcase of your business. Your internet appearance is often the first impression made on potential customers who may have heard of your business through research, referencing by third parties or a high ranking of your name in leading search engines. No matter how people notice your business – we will guide you on your way to a meaningful and user-friendly web page. You tell us about your business philosophy and the goals of your presence in the web – we will create a suiting layout that matches your corporate identity and choose appropriate techniques to realize your page. May it be modern content-management systems, flash-animations, data bases, online shop systems – we will combine all of these tools in a creative functional design to match your needs. If required, we will also maintain, re-launch or optimize your current web page with regards to optimal placement for search engines – please contact us with your inquiries! Web pages must exist in our day and age during continuous changes in their environment and keep their position on Google and Co. or even improve them. We like to help you with our search engine optimization to increase your popularity and visibility in the network and optimize it – don’t hesitate to contact us! Also in social media, we can create professional company profiles, update your pages if necessary and ensure a coherent and successful performance! Marketing is the sum of intelligent strategy and solid planning – essential in order to attract customers, keep existing customers, increase sales and achieve business goals. Marketing is the sum of intelligent strategy and solid planning of activities – indispensible for attracting new customers, keeping existing customers, increasing total revenue and achieving company goals. We will obtain a general idea of your needs, guide you through the introduction and placement of new products or entering new markets. Together, we will identify your target customers and plan your appearance in the press, at events or within your company. Our focus is always the perfect selection of your advertising material such as print, online or direct marketing activities – always optimally aligned with your corporate identity and design. Corporate identity (CI) is the consequent realization of your company’s visual appearance of your company. We will develop a visual identity that matches your company philosophy and products. Corporate identity (CI) is the consequent realization of your company’s visual appearance. We will develop a visual identity that matches your company philosophy and products and guarantees a convincing and consistent public appearance. Your logo is a trademark, the font and the color should stay in your head and be an important part of it and provide an individual identity. All activities – may it be correspondence, web pages, business cards or public appearances of your staff – influence your company’s perceived image. No opportunity of forming a positive company identity and brand recognition should be missed. Part of CI is corporate design (CD) that reflects your visions and goals. Based on your existing images, we will develop a coherent and effective strategy. We will use existing logos, company stationery, business cards and your visions that you have not been able to realize to date. Customer relation management (CRM) is a major factor for well-directed marketing. CRM comprises the maintenance and expansion of existing customer data – all stored in modern data bases that allow instant and effortless access. Good public relations are more important than ever. In a personal meeting, we will analyze your past public appearances. We will generate a ‘status quo’ that considers your corporate identity. In a personal meeting, we will analyze your past public appearances. We will generate a ‘status quo’ that considers your corporate identity and previous press releases, advertising campaigns, flyers, conventions, internet appearance and the effect of your company on your competitors and your customers. Based on the obtained information, we will develop an individualized and market oriented concept for an optimal public appearance of your company. If needed, we will distinguish between image press relation and press relation of new developments or combine both aspects. Ideally, your company should achieve a regular press appearance. Based on our experience, newsletters may not only inform about the introduction of new products or on company news but also provide general information on your company or production sites, interviews or background articles. Such regular newsletters are a very efficient vehicle for creating or heightening public brand awareness. Successful PR requires an in-depth research, as well as the close monitoring of the market. We We will compile print and online publications for documentation purposes. We offer comprehensive assistance for your company’s exhibit at trade shows and events. We will develop concepts for PR-campaigns independently or with your cooperation. You may provide regular text and image information (technical data, resources etc.) for press releases, technical articles or interviews. We will write articles based on the provided raw data, or translate, revise or copy-edit your documents. Prior to publication we will request your approval. The documents will be disseminated target-group-specific via our own extensive network. Because of our excellent contacts to leading technical journals and magazines we are able to stimulate product tests. If required, we will supervise and consult the editorial office in the execution of such tests. We will compile print and online publications for documentation purposes. We offer comprehensive assistance for your company’s exhibit at trade shows and events. Prior to the event, we will provide consulting regarding your appearance and activities during the show. In addition, we will also prepare press portfolios, on-site assistance, and the organization of press conferences and appointments. Successful PR-work requires well-founded reference and topic research and close observation of the market. Naturally, we will conduct these tasks for our customers. For instance, we conduct press and online research, attend trade shows and are in continual contact with representatives of the media. Especially in the water sports and golf sectors, we have complex market and product knowledge that enables us to determine the most functional and economic system. How do we help your company grow by providing technical knowledge and expertise? Especially in the water sports sector, we have complex market and product knowledge that enables us to determine the most functional and economic system. Your own capacities – may it be visiting trade shows, individual product demonstration or personal recommendation – may not always lead to long-term satisfaction. We will provide the necessary support! Windows, doors, shutters, building elements etc. 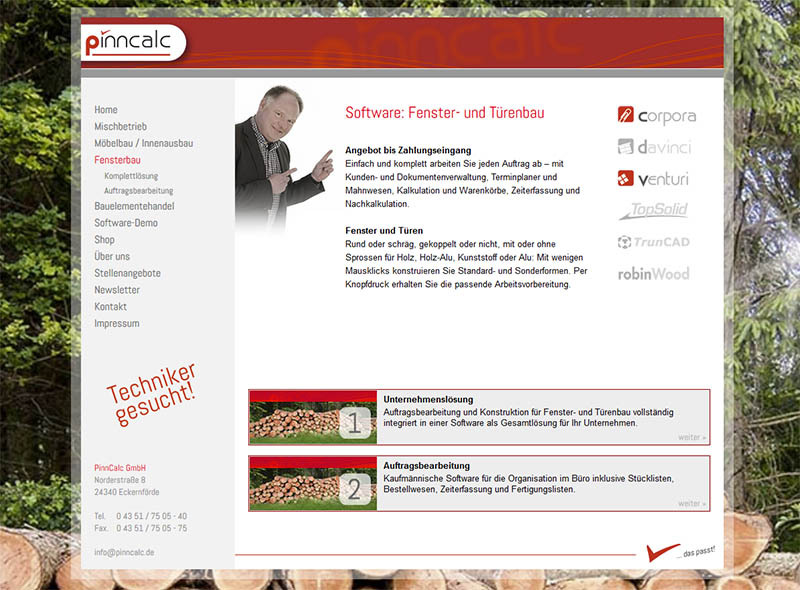 The company PinnCalc for IT consulting and sales-corporation was founded in Eckernförde in 1987. Since then, the company works true to the motto "it fits".This applies to detailed services and expert advices as well as for the development and application of special software for carpenters and joiners. 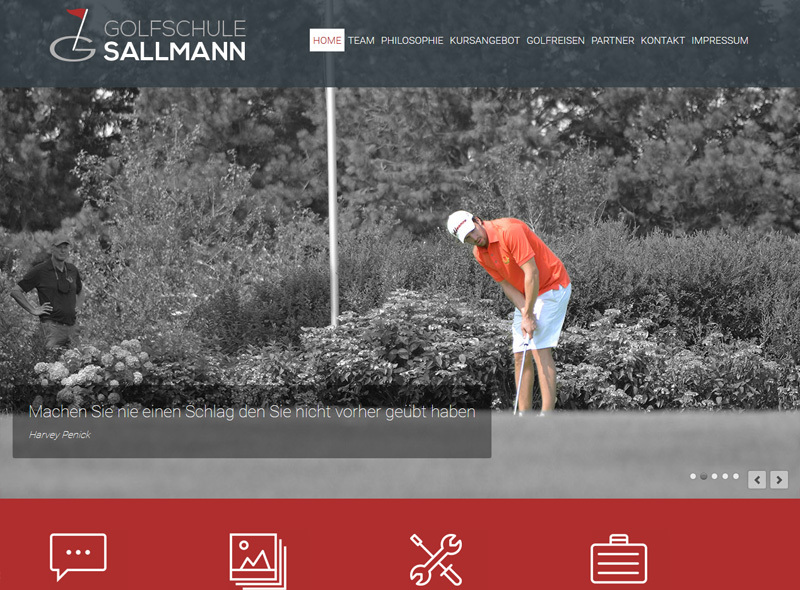 From introductory golf lessons, courses for beginners or weekend courses to mental golf courses up to corporate incentives and intensive individual lessons - at the golf school Sallmannshausen any (future) golfers will find what they are looking for. or how ProSail said: Together it works better. ProSail sees itself as a link between the sporting activities on land and on the water as well as the organizing municipalities with their dedicated local associations. Since 1900 Firmenich Yacht Insurance provides a comprehensive know-how in water sports insurance. Due to the common enthusiasm for water sports and our expertise will advise you at eye level and find the perfect yacht insurance solution. [Nbsp] As in tradition and owner-managed insurance they have established themselves as a quality provider. Nestled in the park of the manor Good Altenhof with its old trees and in a hilly arable, pasture and woodland is one of the most beautiful golf courses in Schleswig-Holstein. This oasis of calm is just 1 km from the Baltic Sea. The 18-hole championship course features pro shop, driving range, chipping and pitching green and putting green. Even good golfers, beyond the borders of Schleswig-Holstein will also be placed on this square in front of the highest standards. client Golf Club Altenhof e.V. The beautiful holiday island of Föhr in the North Sea with its cozy island's capital Wyk should be represented at least once in every holiday album. 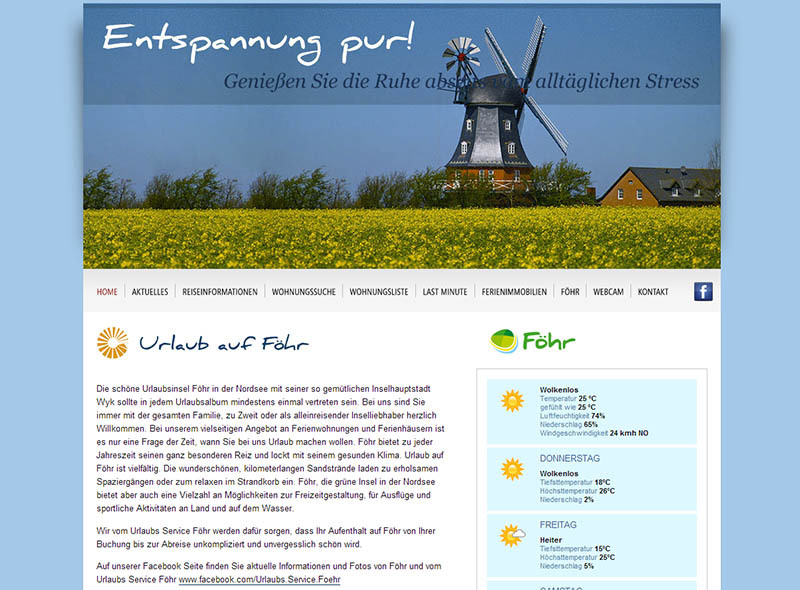 At Urlaubs-Service-Föhr you are always welcome with your family, as a couple or as unaccompanied island lovers. There is such a huge, versatile range of holiday apartments and holiday houses – it is only a question of time when you will arrive for a relaxing holiday. When is the time when Sylt seems the most beautiful? Of course in the summer when beach and nightlife gear seamlessly into each other. And in the fall, when the rhythm of the island slows. The winter is enchanting with its Christmas markets and traditional celebrations. And during the spring! It would be best to keep coming to Sylt - in every season. 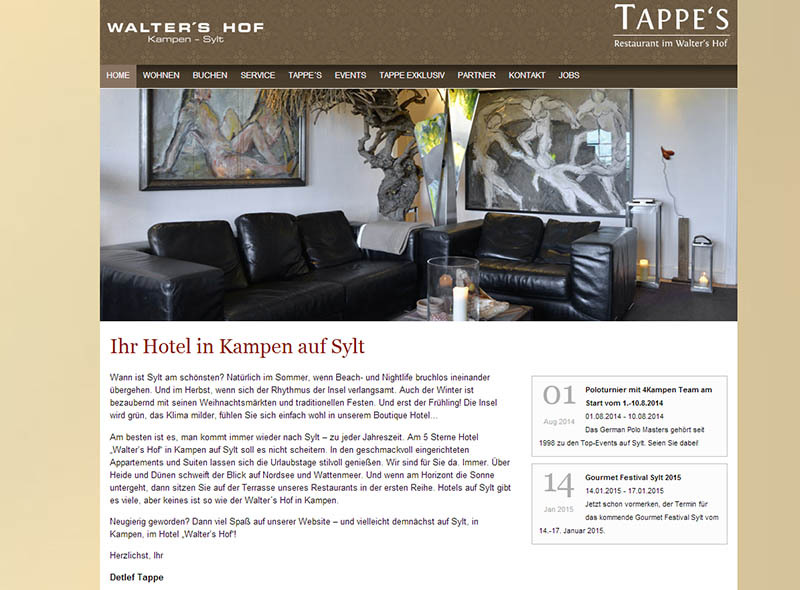 "Walter's Hof" in Kampen on Sylt won’t be an obstacle. In the elegant furnished apartments and suites you can enjoy your holidays classy. The Golf Association of Schleswig-Holstein combines everything that is worth knowing about the current Golf Sport events in Schleswig-Holstein and the latest results and rankings. 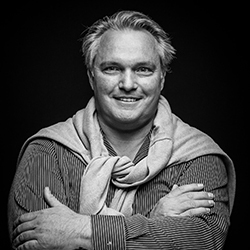 Jens Hannemann obtained his extensive experience in public relations during his studies of oceanography and consulting work for the press and for a range of advertising agencies. After graduation, he was appointed marketing director at Basic Pro GmbH and responsible for advertisement sales of Europe’s largest magazine for Visual Basic. Jens was also responsible for trade show organization and arrangement of booths and for the general development of advertisement strategies and comprehensive customer service. 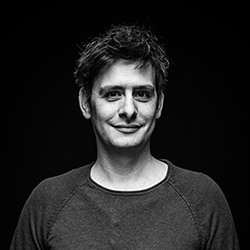 In 1998, Jens founded his agency ‘Jens Hannemann’ as subsidiary occupation and has been heading the agency full-time since 2001. Christian Sudi-Zachow, in the team as a freelancer since 1st January 2009, is a specialist for all web solution and programming as it relates to modern marketing. His extensive experience with large-scale projects are the ideal prerequisite for finding optimal solutions for our customers. His strength is team oriented networking. Christian always listens to our customers and regards their wishes and expectations, he always contributes his own ideas to generate an ideal solution for our customers’ projects. 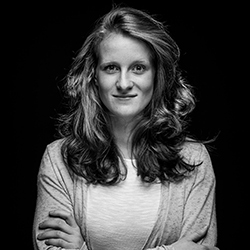 Jenny Bender, since May 2016 in the team as junior adviser. By now by many good ideas and by her carefully, winning appearance she is an enrichment for the team at the harbour point in Eckernförde. Responsibly for the care of web pages, as an enthusiastic sailor for press releases from the maritime area. Thank you for your inquiry. We will get in touch with you soon.